Felicidades!!!!! muy bellas obras...volvere a visitarte... Un abrazo. I've really enjoyed this series Don...especially as the mercury rises in Texas. Gracias, Isabel y bienvenidos a mi blog! It has been pretty warm here, too, Marilyn--though not "Texas warm," I'm sure. But that has probably contributed to me wanting to paint cool water! I like the work you have done with the rocks and water, I love the subject and how you interpreted. I especially like your cool rocks in water, Don. I thought of them when I published my last post. Check it out. Thanks very much, Jesus. I'm happy to get acquainted with your work. Thanks, Sam. Those are some very cool rocks you've collected. 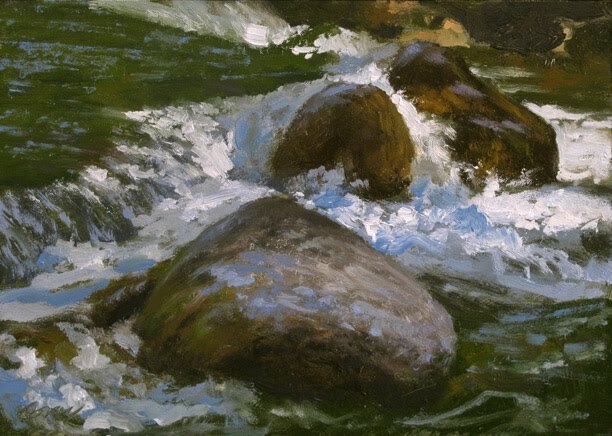 Love the "rush" of the water in this one, Don!